From time to time, with friends, we animate minor scientific events in small Provencal villages. Today March 19th we were in Varages with the local AAP astro club. Fifty kids and residents came to have a look at our star’s volatile proms in H-alpha and some nice spots archipelago’s in WL. We used 3 refractors, a Lunt 35mm a Coronado 60mm and a classical 102/1000 for the WL. The annexed sketch was done in H-alpha, directly on site, to show to the spectators, what can be seen through our material. In parallel some of our wife’s are trying to explain that our sun is a star. 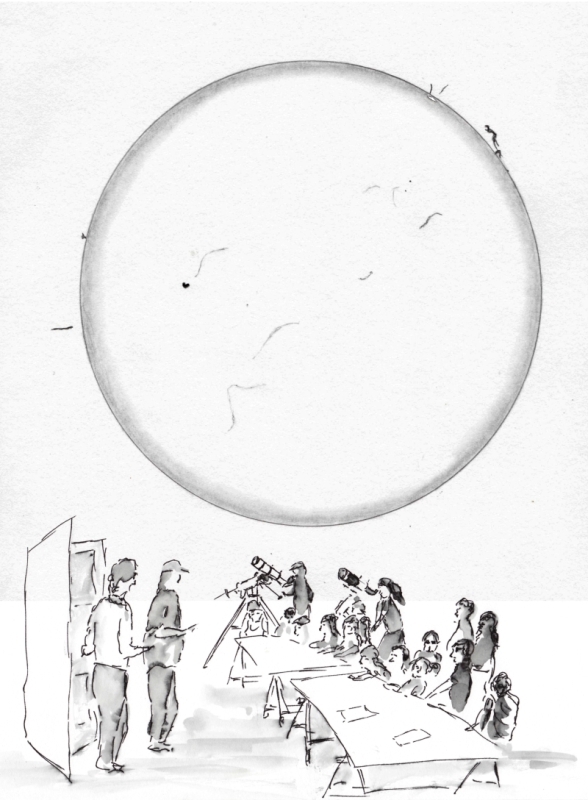 This is a fine outreach sketch and capture of our sun (A star) with an important theme and message. Well done. Thank you, sketch friends !